In this episode we wanted to highlight and focus in on fly fishing, a part of the sport that is often overlooked in current angling programming. The Trout was a particular favourite species of Bernard Venables and featured a lot in both the original book as well as numerous of the famous cartoon strips featured in the Mirror and Angling Times. Whilst in this country fly fishing is seen as an elitist area of angling, it is huge worldwide with millions of anglers across the globe fishing with flies and lures. It was something that Bernard was very passionate about and we felt that it was important to feature the art of fly fishing in the pursuit of trout on one of his all time favourite rivers – The Kennet. 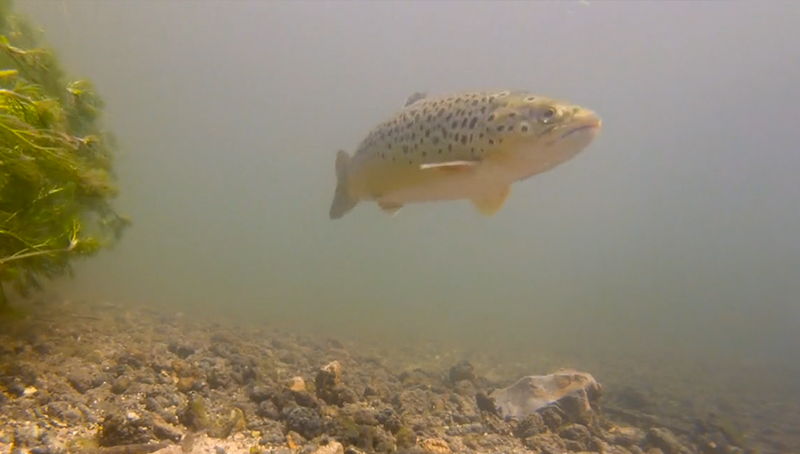 Whilst Mr Crabtree fly fished for a variety of freshwater fish in the original book and cartoons we felt that an episode pursuing the Trout would give us an opportunity to show this discipline in its purest form. We may well set John the challenge of fly fishing for several species in future series so keep an eye out for that. I was already fairly familiar with Wilderness stretch on the Kennet that we had chosen for this episode, having been lucky enough to fish there with Crabtree colleague James Arnold Baker during location visits. It’s truly a stunning piece of water and parts of it feel like a throwback to a bygone age. John of course knows the stretch but hadn’t actually fished it and so this was the first of several challenges he was set for this episode. The other challenges were that, although James had previously fly fished, he was still very much new to a discipline that requires a different set of skills and techniques. In addition, on this trip we had two other Crabtree youngsters in the shape of twins Fleur and Arthur, so John was going to have his hands full and would need to be at the top of his game as guide and coach. The twins had fly fished this stretch with their dad a few times before but like James they were still new to the sport so the plan was to assess James’ ability and to give him a bit of additional coaching in the hope that he would be able to fish independently and for John to then split up his time with Arthur and then Fleur. On a visit to the water the evening before filming proper, John took a look at James casting technique and had a chat to see how much he knew. We didn’t get much action in this sequence as the heavens opened, but Arthur bagged a small trout at last light and we did get some great atmospheric shots, with a beautiful sunny and rainy sunset. Next morning saw the whole team and crew down at the Sportfish complex nearby so that James could meet up with resident experts Alan Shepherd and Robin Elwes to get a few tips, learn some valuable skills and to pick up some tackle, kit and flies. Firstly Alan ran through some of the tackle and flies James would need, talking him through the flies that were currently hatching and matching them with the artificials he had in the shop. Next James was lucky enough to spend a few hours with Robin who is a world renowned fly fishing guru. Robin helped James with his casting technique and then let him practice before attaching a hook and seeing if they could put these new skills into practice and to bag a trout from the Sportfish lake. After a few heart in the mouth follows and misses, James finally netted a small but very appreciated trout, witnessed by John and the twins. It was then time to pack up the trucks and get down to the river but not before Alan saying farewell to our three Crabtree kids and handing them all rods and reels and a host of other goodies. Sportfish is a great place to go whether as a newbie or seasoned fly fisher as there are resident experts and coaches, you are able to try out new kit from the shop on the adjacent lake, can have lessons or just pop along and fish. it’s a one stop Mecca for fly fishers or people wanting to have a go at the sport and it’s literally a one stop shop all in one location. Their ethos is all about making the sport accessible to all, to remove some of the myths and to essentially help people become proficient in fly fishing and making sure they have the right knowledge and kit. A big thanks to all at Sportfish and to Alan and Robin for their support and for doing things the Crabtree way. Finally, to the fishing….The Wilderness looked stunning and we had spotted lots of fish in the gin clear waters of this traditional chalk stream. John and James planned out their attack and it was decided that John would take Arthur off and hat James would fish near to and with Fleur for starters. Quite quickly, after a few near misses, Arthur bagged his first fish which turned out to be a Chub. not the intended quarry but a lovely fish and the first Chub he had ever caught. Following on from this we had a lovely sequence of fish with several trout coming to he net. Equally as rewarding though was how well Arthur responded to John’s teaching and the way in which they bonded. In fact both of the twins really came out of their rather shy skins when fishing with John and all could see how much they love their fishing. While John and Arthur were having great fun catching further upstream, James and Fleur were also enjoying some fantastic action resulting in several brownies and Rainbows to their rods. What was also great to see and capture on camera was James taking in the role of John and teaching and guiding Fleur in her fishing. A really nice thing to witness with them being unaware that they were on film at the time and again showing how fishing brings people together and is very much a sport that whilst often an individual pursuit, can very much be shared and enjoyed with friends, male and female, young and old. After lunch John fished with Fleur on another scenic piece of the river resulting in a big beautiful trout that they stalked, cast to and was played brilliantly by Fleur. We already obviously knew how much James loved his fishing and how animated and passionate he is but it was lovely to see the twins come out of their shells when they were fishing in an unrestricted and enjoyable way. John let them make their mistakes and was on hand to help them when needed and the transformation in them from shy and quiet to very excited and non stop chatter in just a few hours fishing was great to see. We wrap this episode up with a piece from John to camera reflecting on how much he enjoyed the trip and how the kids responded. He also reflects on the fact that sometimes it’s not always about following a totally purist approach when teaching or enthusing kids to fish. John and Crabtree is all about attracting youngsters and new people to angling, as well as entertaining all of you passionate anglers out there, and it’s about making it accessible that is key. Putting up barriers, talking jargon, having lots of rules and not making it fun doesn’t make any new sport or hobby interesting and so it’s import at for all of us to open this great sport in its many guises to everyone and to help people see why millions of us go and love fishing. I hope you enjoy this episode even though you may not, like me be a big fan or have even ever tried fly fishing. Its a gentler style of angling and the fish might not all be huge but it’s very engaging, a real art, in beautiful settings and I hope that like me and the crew you think that our three Peters are all stars. Look out for the Directors Cut of our Carp episode next week with some star names and two great venues here and in France.